These comical Everyday Heros is part of our popular range of hand painted resin figures. Each character wears a broad heroic smile of achievement. 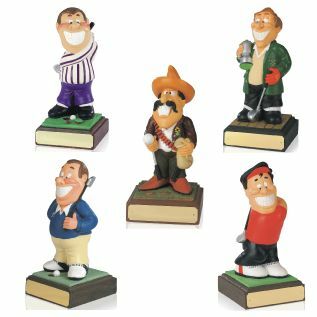 This golfing character can be personalised with your own message on the plain "Engraving Plate" supplied. Standing 8 inches high, these Super Heros makes a great value humorous prize or gift to celebrate a memorable golfing achievement.